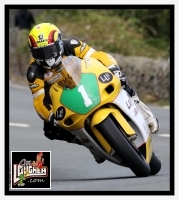 Team ILR's ten times Isle of Man TT winner Ian Lougher's Classic TT could be described in footballing terms as 'a game of two halves' with the disappointment of his retirement in the Senior race made up for with a fine second place ride in the Lightweight Classic TT. As in 2016, Ian again teamed up with LayLaw Racing's Eddie Laycock and Gerry Lawlor to ride their TZ 250 Yamaha in the Lightweight Classic TT. In the Senior Classic event, Ian was entrusted to again compete on the iconic MV Agusta owned by John Chapman. Ian arrived on the Isle of Man straight from overseeing Team ILR's efforts at the British Superbike round at Cadwell Park and soon re-acquainted himself with the 250 Yamaha at a test session at Jurby. With the cancellation of Monday evening's practice session, he wasted no time laying down the first marker of the week in the Lightweight class by topping the leaderboard with a very respectable lap of 113.99 mph with Bruce Anstey second at 113.01mph. On Wednesday Ian again headed to Jurby for his first run on the MV and Wednesday evening saw him register his first lap on the iconic bike, and he took things steady to finish 11th quickest whilst continuing to be among the pacesetters in the Lightweight class. The following evening Ian was second quickest in the Lightweight, and he also broke the 100mph mark on the Italian machine to lap at 101.67mph to finish 8th quickest in the Senior. Unfortunately, the weather intervened on Friday evening to bring about a cancellation of the practice session with only the Superbike and Lightweight classes running, which meant that Lougher only had four laps of practice on the MV Agusta during the week. Both Ian's races took place the following day and, after a short delay due to an oil spill, racing got underway with the Welshman carrying the illustrious but not exactly ideal Number 1 plate, getting proceedings underway in the Senior Classic TT. Unfortunately, it was to be a short lived race as Ian was soon reported as a retirement at Greeba Bridge. 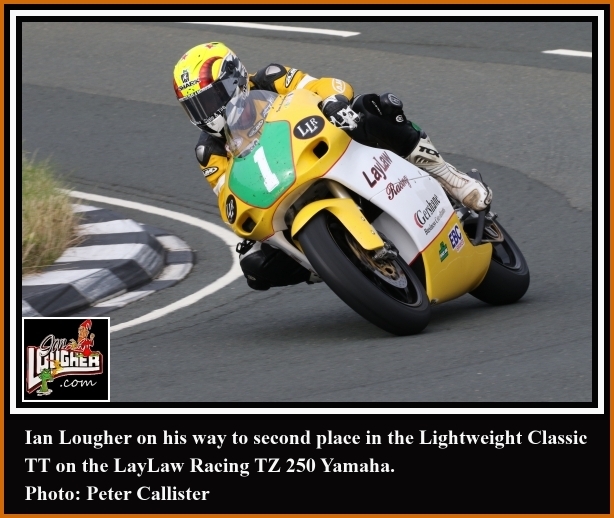 Lougher then dusted himself down from this disappointment to take part in the Lightweight Classic TT in the afternoon. Again first away, he settled into a steady rhythm and rode his own race as Bruce Anstey set a blistering pace to lead the race. As they pitted at the end of the second of four laps, Ian was riding well and was lying fourth just 8 seconds behind third placed Michael Rutter. On Lap 3 Daniel Sayle retired from second as Rutter and Lougher now battled for second with 13 seconds splitting the two. But by Ballaugh on the last lap, the deficit was down to 8 seconds as back markers came into play for both riders. Over Ian's favourite Mountain section the gap to Rutter was halved, but he couldn't quite get there to finish the race with just 2.36 seconds separating the two. However, it didn't end there as the post-race technical inspection revealed an irregularity, with Michael's Ducati having an oversize fuel tank and therefore eliminating him from the race and elevating Lougher to second place to repeat last year's result for the Laylaw Racing team. "Well the Classic TT is over once again, and what a great festival it is too, everybody enjoying it more and more each time. For me, it was great in some ways and a little frustrating in others. It puts a bit more pressure on you when you go off at number one too, but I've done it before and can handle it ok, except it's a little more difficult when you have Bruce starting right behind you on such a quick bike. Congratulations to Bruce on being the first person to do a 120mph lap on a 250, although I did say long ago it was possible if everything clicked on the day. On my Laylaw Racing Yamaha, Eddie and Gerry and all the guys worked hard to give me a great bike, but I do feel we missed something in getting the best out of the bike on the day. Two strokes are difficult in getting the right compromise between speed and reliability, but we'll bounce back next year with some trick bits of our own to surprise a few people. On John Chapman's MV500 we managed 4 laps in practice, Arran, John, Carl and the guys had worked wonders on lots of aspects on the bike, so I felt really comfortable and confident on the bike going into the race and looking forward to a rostrum finish. But it wasn't to be as I think it dropped a valve as I approached Greeba on the first lap...so disappointing for everybody involved. I would have loved to have given John Chapman a really decent finish as he has put so much work and effort into this project, but we'll have to wait for another year at least now. 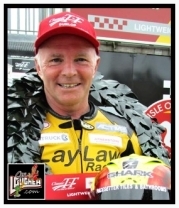 From Asa and myself, I want to thank both the Laylaw Racing and John Chapman camps for all their hard work and enthusiasm, and look forward to working together again soon." 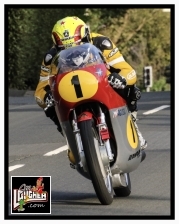 Ian Lougher on the John Chapman Racing MV Agusta. Lightweight Classic TT ~ 2nd. Ian in action on the LayLaw Racing TZ 250 Yamaha. Copyright 2017 IanLougher.com All Rights Reserved.